A city of quirky sophistication, Seattle juxtaposes natural beauty against urban excitement: a snowcapped Mount Rainier towers over the city behind the Space Needle, the waves of the Puget Sound roll up against the wooden piers surrounding Pike Place Market’s hustle and bustle, and views of the Olympic Mountains aren’t far from Pearl Jam and Nirvana’s early haunt, the Crocodile Cafe. 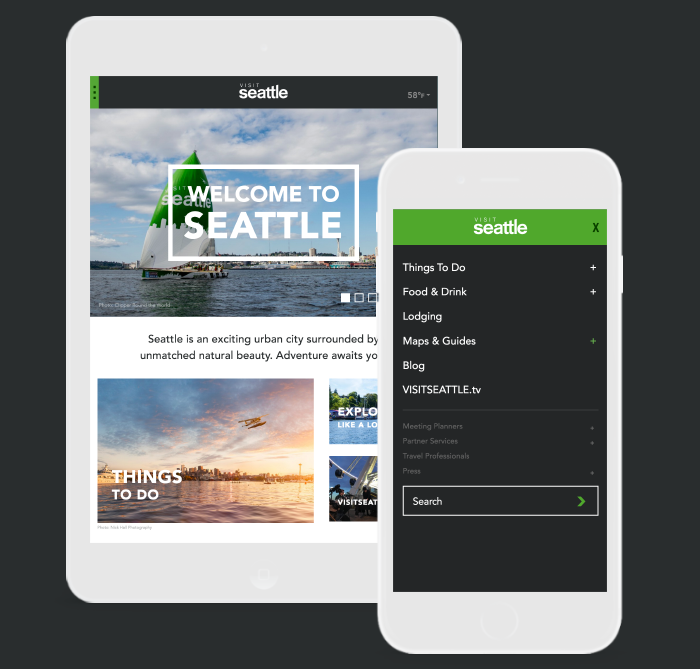 To visit Seattle is to experience a city of contrasts with a seemingly endless list of things to do, and a website representing the Emerald City not only required an intuitive user experience, but a strategy centered around meeting every visitor need and a powerful back-end engine to deliver third-party content across the site. Visit Seattle does more than serve up things to do lists for family vacationers and weekend revelers, it communicates to meeting planners in search of convention space, restaurant managers hoping to boost business, and Seattle residents researching their own weekends. So how do we meet the intentions of all these users? An intensive digital marketing research phase, in which we crafted personas to represent audience types, fueled the long-term strategy and architecture of this complex site. 8,000 pages of events, restaurants and tourism information required re-working the model for a sitemap and information architecture. Using the data gathered in our digital marketing research and by working hand-in-hand with the client, we consolidated pages – taking great care on a page-by-page basis – with no ill effect on post-launch site traffic. In turn, this made for cleaner content navigation throughout the site, which relies on primary, secondary and tertiary navigation menus. 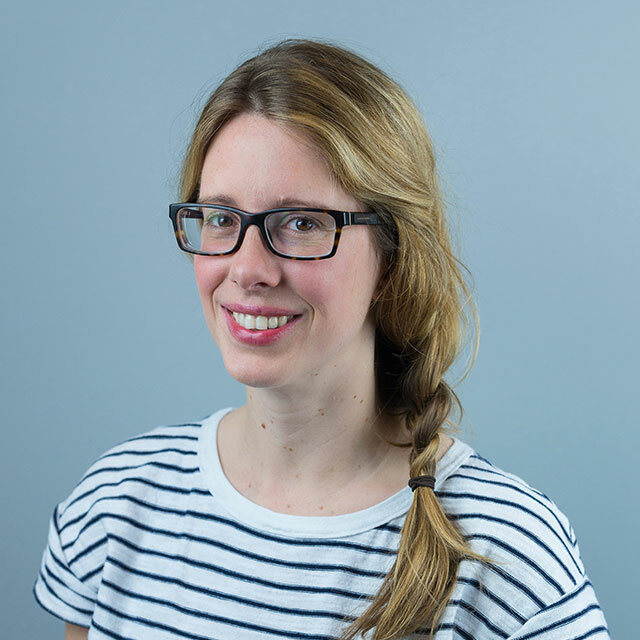 Make your API list and check it twice. The list of third-party data integrations was by no means short. 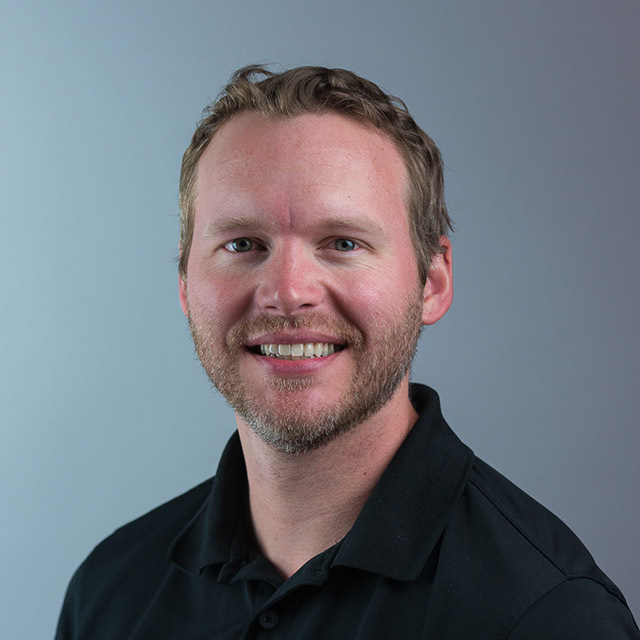 This made the planning stage all the more important, and by doing our tech spec homework, we were well-prepared for every site feature and custom functionality heading into the development stage of the project. Equally important, our digital marketing team did its own homework. 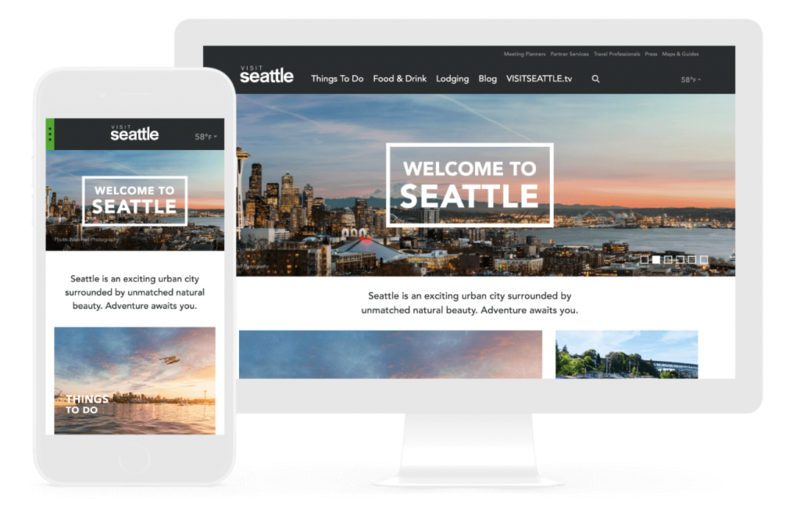 By examining organic search traffic, taking a deep dive into existing analytics and by constant communication with Visit Seattle’s stakeholders, we sought out opportunities to better promote existing content and ensure key pages remained at the forefront. Our team wanted Seattle’s diverse landscape and quirky sophistication to shine through in our design, and we relied on custom icons and beautiful photography to carry the message. Starting with the wireframes, we proposed a photographically-driven site to highlight this bustling city surrounded by peaks and waterways, and collaboratively focused on how we wanted the user to experience the flow of the site. It’s easy to intrude on usability and distract with obtrusive design, but we take caution and save our bells and whistles only for when it’s right. By breaking the pattern of expectations from the user, we introduced some small surprises along the way like the hover states you’ll discover on blog posts and neighborhood navigation. The ill-informed belief WordPress can’t power your major site went up in flames long ago, but Visit Seattle’s site is more wood for the fire. Frustrated by their previously static and difficult-to-manage site, Visit Seattle’s team wanted more control. With WordPress, they’re seeing benefits in the same way as big brands like The New Yorker and Sony Music. 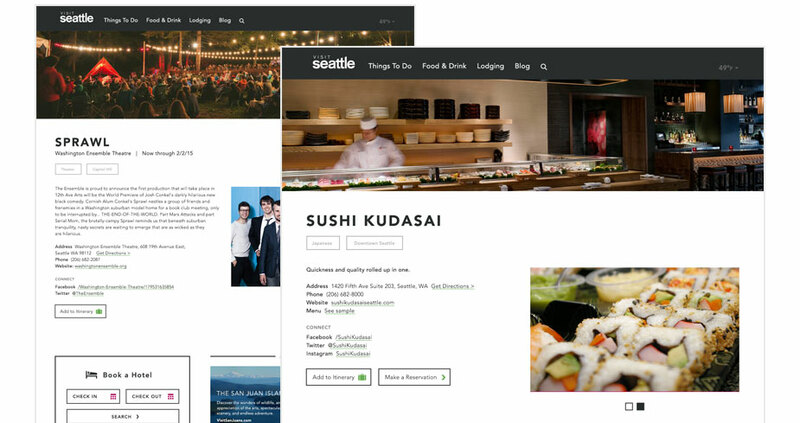 We want to empower our clients with flexibility and configurability, so when Visit Seattle approached us, we jumped at the chance to sink our teeth into delivering a site as easy-to-use behind the scenes as it is for the end user. 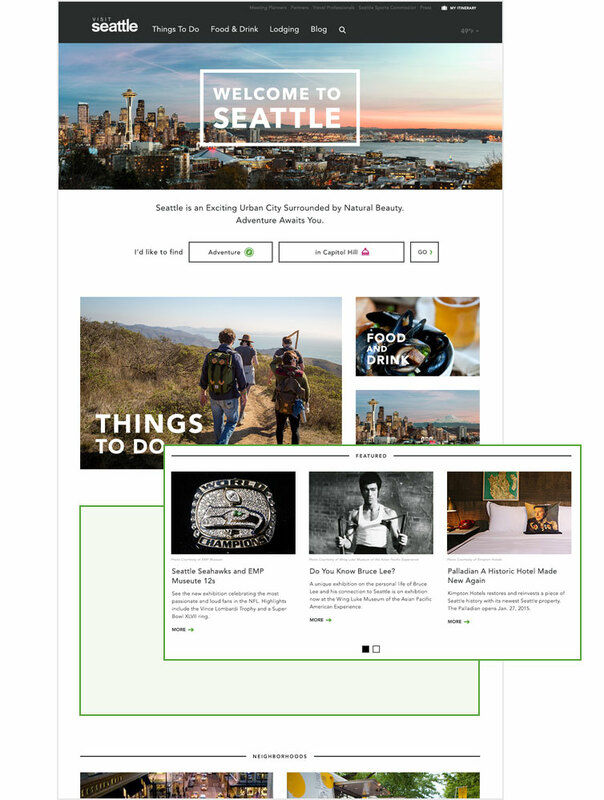 By using content blocks, we give Visit Seattle complete control and maneuverability; moving a call-to-action button or a feed of Instagram photos up the page is as easy as a drag-and-drop. 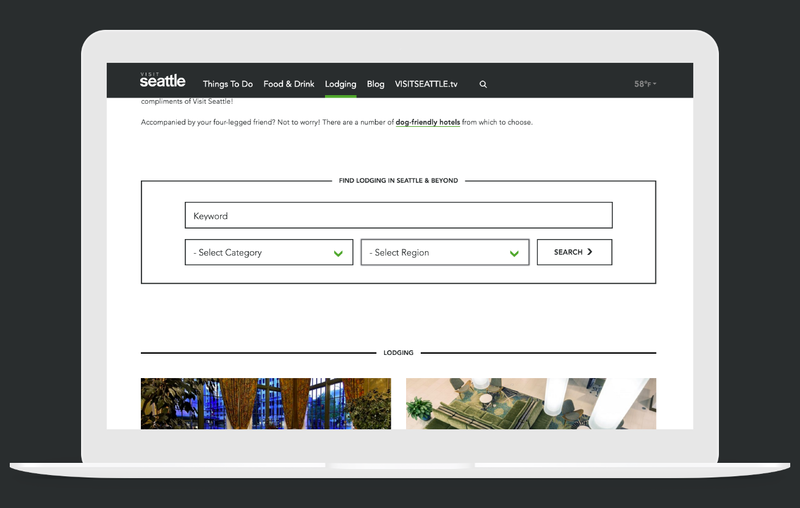 Take visitseattle.org for a quick spin and you won’t notice all the heavy lifting going on in the back-end: multiple third-party feeds to deliver events, partner listings, real-time weather conditions and hotel booking widgets. All of this data integration put our developers to the test. The tidy work on the back-end of the site resulted in a seamless user experience on the front-end. Visit Seattle’s on-site search shows off a big win for our developers. The unique and vastly improved functionality allows you to drill down with your search queries. Are you a meeting planner? We’ll push a data set just for you via the Meeting Planner search. This customization within search allowed Visit Seattle to speak to the aforementioned array of audiences visiting its site. 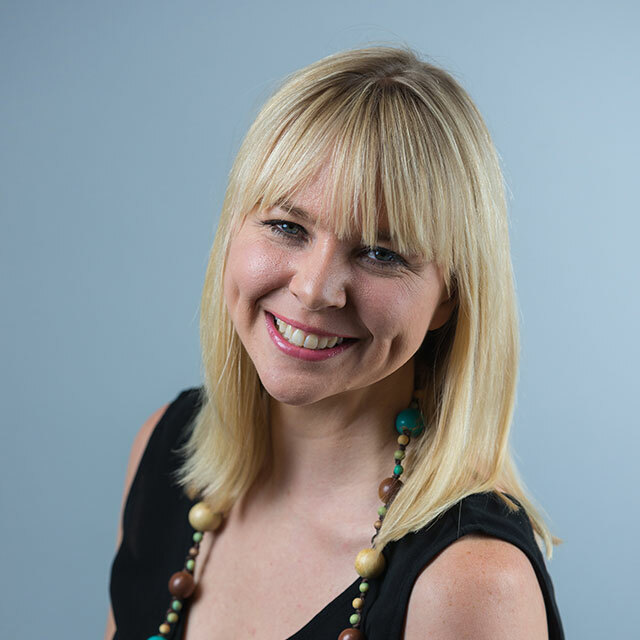 Visit Seattle may be a non-profit marketing organization, but the bottom line still matters — and the work of our developers allows them to sell more partnerships. Partnership advertisements provide a source of revenue, plus every restaurant and hotel on Visit Seattle boasts its own dedicated page with rich, visual content. We don’t create sites to be perfect, we create them to be perfected. That’s why our relationship with Visit Seattle relies on an ongoing partnership to push for better results, always with a steady eye on delivering the visionary digital experience you expect from the Emerald City. This hard work and client collaboration extends beyond the site redesign — we’ll be creating more tools to make every site visit engaging, interactive and representative of this exciting urban city surrounded by natural beauty.